Do cruise ships have a place in our waters? 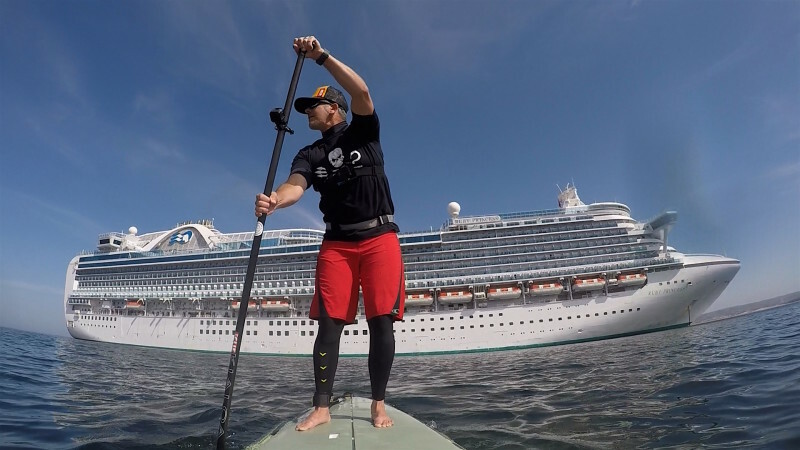 On a clear fall morning last year, Monterey resident Brent Allen stood with his feet planted squarely atop his stand up paddle board and dipped his oar into the cold ocean, propelling himself slowly toward a towering white-sided cruise ship anchored just off the coast. Seeing it out there had caused him to question his vision—his expectation of what the National Marine Sanctuary would legally accommodate did not include such an expansive, consumptive form of tourism infrastructure. Allen, an avid ocean-goer and environmental activist, says he sees the sanctuary’s waters as sacred territory, in no small part due to a life-altering experience he had aboard his stand up paddle board near Pebble Beach’s Stillwater Cove in 2014. A group of about 20 humpback whales had begun to collectively lunge feed all around him, diving and spouting. Allen looked at the cruise ship and saw an accident waiting to happen—a possible catastrophic oil leak, the release of dangerous chemicals or contaminated waters, even the prospect of uneducated passengers tossing waste over the railing—all of it seemed like an unnecessary risk. 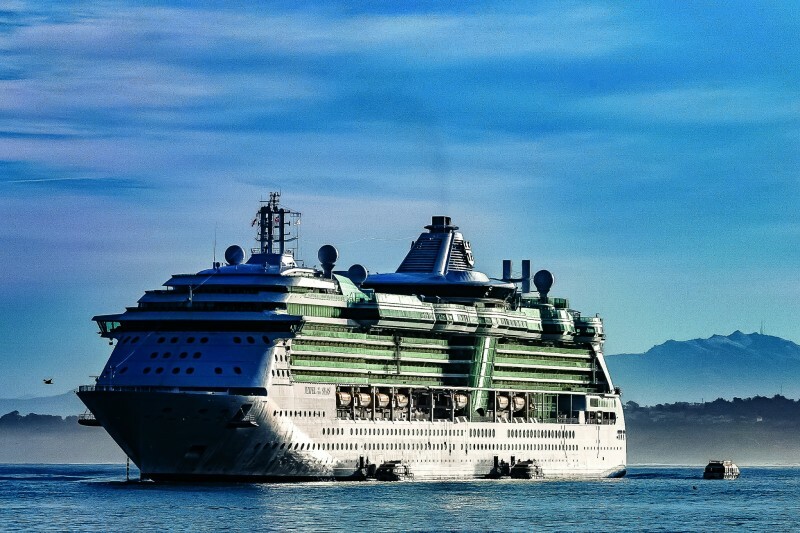 The cruise ships that visit Monterey Bay pose a level of environmental risk in the forms of accidental hazardous waste discharges, a degree of marine life interference, considerable fossil fuel consumption, and—the worst-case scenario—an oil leak. But the massive vessels also mean big business for Monterey. The scheduling for the ships ushers them in during normally low tourism times, providing a significant bump in business sales, says Interim City Manager for Monterey Hans Uslar. Over the course of a year, between seven and 12 cruise ships owned by several cruise lines will drop anchor in Monterey’s waters. This year, 10 ships are scheduled to anchor in Monterey Bay, he says, and 12 are scheduled so far in 2019. The cruise ship companies pay $7 per passenger directly to the City of Monterey, which is put into the Tideland’s Trust, operated under a State Lands Commission Grant. The funds are allocated by the city for repairs and maintenance along the waterfront, such as the wharves and the marina. Uslar estimates that revenue paid annually to the city by cruise ship companies is between $75,000 and $100,000. Monterey Harbor Master John Haynes, whose office oversees scheduling and oversight of cruise ships in partnership with the city manager’s office, explains that the visitation is heavily regulated with various precautionary measures taken. The ships are permitted to drop anchor in only two precise locations, preventing reef damage, Haynes says. While ports that are not in national marine sanctuaries do allow cruise ships to discharge graywater—used water from sinks, showers, and galleys—the Monterey Harbor forbids it or the release of any other potentially harmful substances through a contract with the City of Monterey. In October 2003, a visiting cruise ship called the Crystal Harmony violated that contract with the city when a crew member discharged more than 36,000 gallons of wastewater about 30 miles south of Monterey, just off the Big Sur coastline. The ship’s chief officer, who was the watch officer that night, failed to remember the regulations for the sanctuary, says Scott Kathey, Regulatory/Emergency Response Coordinator for the NOAA Office of National Marine Sanctuaries. “The City of Monterey didn’t receive the reports and the cruise line stonewalled them for a while, and then the city banned them from Monterey for 15 years,” he says. The ban on that cruise ship ends this year, and the Crystal Symphony, of Crystal Cruises, will visit Monterey on Aug. 2. Friends of the Earth’s Cruise Ship Report Card, an annual evaluation on cruise companies environmental footprints, has ranked the company with all Fs through 2016. The episode with Crystal Harmony in part helped to prompt federal legislation in 2008, which prohibits any discharges by a cruise ship in the sanctuary except for clean cooling water and some deck washing. The law also enables an unannounced inspection program in which sanctuary staff, including Kathey, and United States Coast Guard personnel, will randomly board visiting cruise ships. Kathey says that the 2003 Crystal Harmony incident is the only violation the sanctuary was aware of—until recently. Last fall, an unnamed cruise ship was en route from San Francisco to Monterey and was in sanctuary waters when a crew member discharged its treated sewage and saline water from the ships desalination system, streaming it out as they traveled into the local port. The violation is currently under investigation by the NOAA Office of Law Enforcement, which means details are limited. NOAA’s office of law enforcement did not reply to a request for comment by press time. The Monterey National Marine Sanctuary was put in place in 1992, originating with a campaign by Save Our Shores to block oil drilling in the marine habitat. Brent Allen believes that allowing cruise ships to anchor out in the sanctuary is not a far cry from allowing big oil in, based on the amount of fuel contained by the industrial ships and their level of diesel emissions. “If a cruise ship had a major accident here, what would the difference be if an oil rig blew up?” he asks. 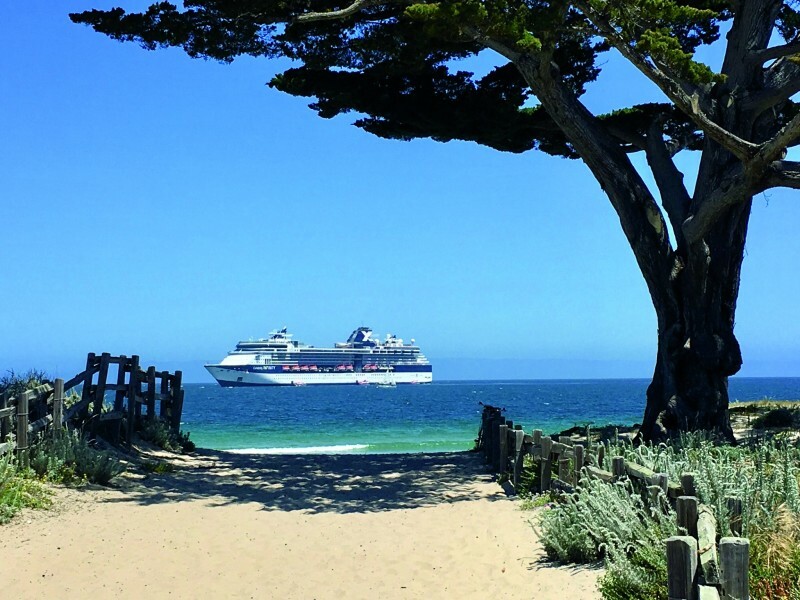 Katherine O’Dea, executive director of Save Our Shores Santa Cruz and a member of the Sanctuary Advisory Council, agrees that any time a cruise ship comes close to shore, there is a risk of calamity. But she also notes that the safety precautions are intensive. The organization did weigh in between 2003 and 2005, following the wastewater scandal with the Crystal Harmony, but O’Dea was not yet part of the SOS team. Allen says that every city situated on the Monterey Bay should be permitted to weigh in on whether cruise ships anchor in the bay, largely because multiple industries and communities would suffer in the event of a major accident. The Friends of the Earth “Cruise Ship Report Card” compares the environmental footprint of 17 major cruise lines and 171 cruise ships. The ships are evaluated on how they manage sewage, air pollution, water quality compliance and overall transparency. While some cruise companies appear to be operating with green standards, most are reviewed poorly. The following are the final grades across categories for each cruise ship that will visit the Monterey Bay in 2018. Next: (VIDEO) SUPsquatch VS. GAINT SUNSET!!! The cost benefit of allowing cruise ships into a tourist driven economy local is basically short sighted, especially in a marine sanctuary. Just one accident, one cataclysmic storm or wave and there goes the reason why people want to come to such a pristine location. One harbor master being granted the power to approve is so dangerous and alarming! Monterey Bay would be ruined forever if there were an accident or even just an incident. Environmental concerns should be raised immediately. What is the data on what will happen to the whales that now call this area a vital part of their habitat. Noise intrusion alone could deplete populations of all these whale groups.